5B: Permafrost; Frozen Soil Starting to Thaw! EarthLabs > Climate and the Carbon Cycle: Unit Overview > Lab 5: Soil and The Carbon Cycle > 5B: Permafrost; Frozen Soil Starting to Thaw! Part B: Permafrost, a Frozen Soil Starting to Thaw! If you walk along the Siberian tundraa vast, flat, treeless Arctic region of Europe, Asia, and North America in which the subsoil is permanently frozen. you have to watch where you walk. You could fall into a thawing sink hole, trip over a mammoth skull, or even come upon a buried Iron Age tomb with bodies and horses still frozen inside from thousands of years ago. This is the Siberian permafrost – a soil that has been frozen for thousands of years. As the climate warms, the permafrost is changingit is beginning to thaw. To learn about permafrost, watch Thawing Permafrost at NBCLearn's Changing Planet website. Next, watch the YouTube - A Thawing Climate video, below. What evidence did you observe that permafrost is thawing? What evidence did you observe that methane exists in large amounts in the permafrost? The "permanence" of permafrost depends on the length of seasonal freeze-thaw cycles. In Arctic tundra freeze-thaw cycles, winters are long and summers are short. 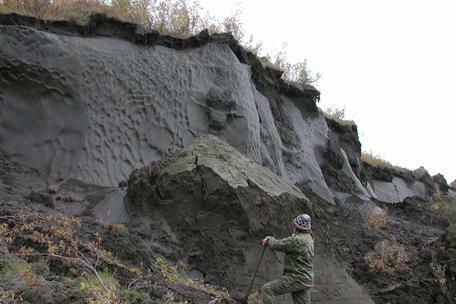 The active layer of permafrost, the topmost layer of soil, thaws in the summer and freezes in the winter. During the summer, the active layer warms up enough for plants to grow. Because the Arctic is warming, many permafrost regions now have shorter winters. In these areas, scientists have observed an increase in the depth of the active layer and a decrease in the depth of the permafrost. Consider the diagram of permafrost soil pictured above right and make special note of the active layer. This layer contains carbon from dead plants and animals that have died within the past few years. 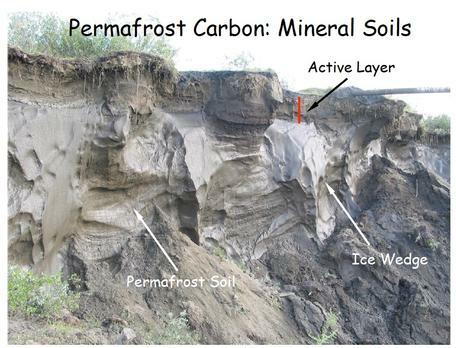 The permafrost contains very old carbon- perhaps hundreds to thousands of years old. When this permafrost melts, the carbon is made available to microbes which then produce carbon dioxide and methane. Describe how changes in the depth of the active layer of the freeze-thaw cycle could "unlock" some of the Arctic carbon in this soil. What role would microbes have in this process? Microbes and Methane (CH4)Double Trouble? So far, you have learned a lot about soil microbes, decomposition and the release of CO2 during soil respiration. 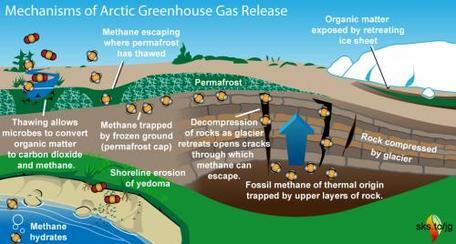 But, there is another greenhouse gas besides CO2 that has permafrost scientists worriedmethane (CH4)! Remember that you were introduced to methane as a permafrost problem when you watched the video at the beginning of this lab. Click to enlarge the image on the right and make note of the sources of CO2 and CH4. Arctic researcher Katey Anthony lights some of the methane gas bubbling up from a pond on the University of Alaska, Fairbanks campus. 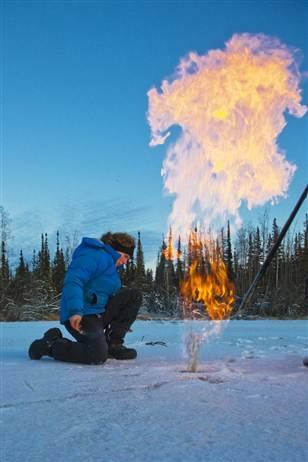 Scientist K. Anthony lighting methane in an Arctic pond. Courtesy: Todd Paris, University of Alaska at Fairbanks. Although Arctic methane has many different sources, a primary source for methane in the permafrost are microbes. Not all soil microbes respire in exactly the same way. 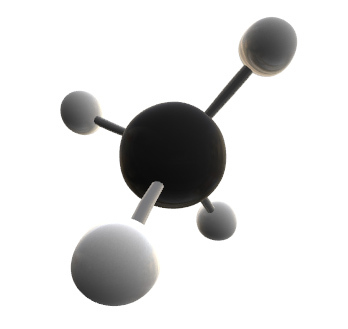 Methanogens are a group of microbes that produce methane instead of CO2 when they respire. Methanogens live and thrive in very low-oxygen (anoxic) environments such as the muddy bottom of the pond in this image. You will typically find methanogens in water-logged, anoxic environments such as wetlands, marshes, bogs, muddy bottoms of lakes, and rice paddies. 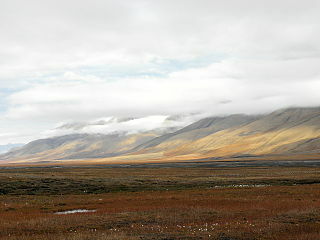 With its seasonal thawing and freezing, much of the Arctic tundra is water-logged providing perfect environmental conditions for methanogens. What's so bad about microbes releasing methane (CH4)? Like carbon dioxide, methane is a greenhouse gas that traps heat in the atmosphere. However, methane can trap infrared heat far more effectively than CO2. Although methane's potential to trap infrared heat is twenty-five times greater than CO2, methane's life span in the atmosphere is much shorter than CO2. As a matter of fact, methane's atmospheric life span is around 12 years compared to carbon dioxide's atmospheric life span of up to 200 years. Fortunately, scientists have found methane-munching bacteria (methanotrophs) in permafrost soil that chemically "eat" methane for carbon and energy. Unfortunately, these methane-munchers then respire CO2 instead of methane. 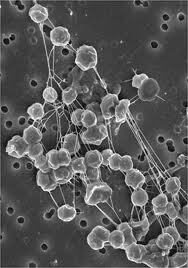 1: Explain how a thawing permafrost creates ideal environments for methane-producing microbes (methanogens). 2: Describe how a thawing permafrost could impact the current greenhouse effect. Follow the work of two researchers who are tracking carbon in the warming Arctic tundra. First, watch a video of Dr. Katey W. Anthony Hunting for Methane in the Arctic. Scenario 1: Warming increases plant growth and it promotes the invasion of shrubs and trees into tundra landscapes. Both of these processes can increase the amount of carbon stored in plant biomass, thus reducing the amount of C in the atmosphere. Scenario 2: At the same time, permafrost thaw may stimulate the microbial decomposition of the carbon in soil. This decomposition can decrease the amount of stored carbon by releasing more CO 2 into the atmosphere. These metabolic by-products of respiration. (CO 2 and CH4) are the same "greenhouse gases" involved in climate change. What are they doing to track the carbon in carbon dioxide (CO2) and methane (CH4) as the tundra warms? What evidence do they find that would indicate that the release of CO2and/or CH4 is being amplified? Does their research "uncover" evidence for possible feedback mechanisms as the permafrost thaws? With a partner or group, review your notes on Dr. Anthony's and Dr. Schuur's research. Are a warming Arctic climate and a thawing Permafrost related to each other in a feedback loop? Use your notes to draw a diagram of any potential feedback loops that might exist due to a warming Arctic climate. When you are done, share your feedback diagrams with the class. Are these potential feedback loops positive (reinforcing) or negative (balancing)? How do you know? Would these permafrost feedback loops impact only the Arctic, or do they impact the global carbon cycle? Explain your reasoning for your answer. How does your experiment on the effect of temperature on soil respiration inform your understanding of the potential impact of permafrost thawing to change the carbon cycle? Investigate how much the thaw depth of the active layer has changed over time at different research sites in the Arctic by going to the Circumpolar Active Layer Monitoring Network site - CALM. After you read about CALM, click on the data tab in the menu on top. Then click on the map on the left-hand side. This will take you to the next page where you will see a CALM summary data table of site averages of the annual end-of -season thaw depth (cm). Choose data from an Arctic location and a measurement type - (P - mechanical probing, T- ground temperature measurement or TT - thaw tube measurements) Note that at some sites, more than one type of measurement has been taken. Graph data from one or more sites. Report how the depth of the active layer has been changing from the date of the first measurement. What trends and variability to you see in the data? Are these trends and variability the same in all locations? Read about the permafrost tunnel in Alaska.